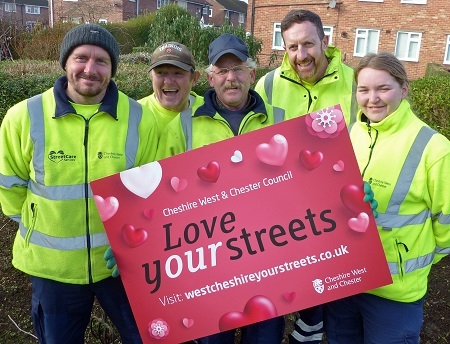 This Valentine’s Day Cheshire West and Chester Council is asking residents and communities to join them in making the borough’s streets and neighbourhoods the cleanest, safest and greenest in the country. 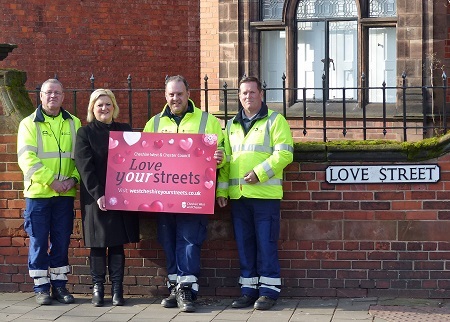 The ‘Love Your Streets’ campaign will help residents, businesses and communities be part of the Council’s plans to improve the local environment. The strapline for the campaign combines the words ‘your’ and ‘our’ to promote how the council and communities can work together to make a difference. Information about what the Council has planned for the campaign will be coming through the letterbox of every household in the borough over the next few weeks in the latest issue of the Recycle First newsletter. Plans include the recruitment of dedicated officers to tackle environmental issues in communities and a new rapid response team which will respond to requests quickly and effectively, so existing officers are not called away from day-to-day operations. The campaign also aims to encourage volunteers to get involved with a new tool bank available for hire to help with light maintenance and community clean-ups. The Council spends hundreds of thousands of pounds every year just to clear litter and fly-tipping to keep the borough looking tip top. And it’s not just about money as there are indirect costs too, such as the harm it can do to the environment. 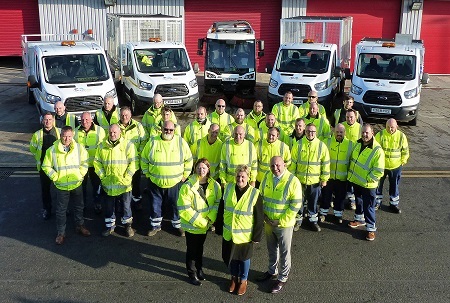 The Council’s Cabinet Member for Environment, Councillor Karen Shore said: “We’ve listened to residents and they’ve told us they want their streets and communities to be cleaner, safer and greener. “We know our residents have great pride in where they live and we are asking everyone to work with us and love their streets. With your help, we can all make a real difference. This new campaign aims to get the whole community to work collectively to improve our local environment and the support of residents will be vital to its success. If there is an environmental issue in your area, such as graffiti or fly-tipping, please use the Your Streets website to report it – www.westcheshireyourstreets.co.uk. The website makes reporting problems easy and provides useful information about the range of services the Council provides in communities across the borough. Ready to Love Your Streets - staff from the Council’s StreetCare Services teams along with (L to R) Maria Byrne, Director of Place Operations; Cllr Karen Shore, Cabinet Member for Environment and Mark Brazil, Senor Manager StreetCare Services. The campaign will also involve the Council's Highways, Regulatory Services and Waste Management teams. A StreetCare Services team posed for a photo while they worked on shubbery in Weaverham, Northwich. Left to right - Martin Cooper, Paul Heardley, Paul Hughes, Glyn Jones and apprentice Aleasha Rimmer.